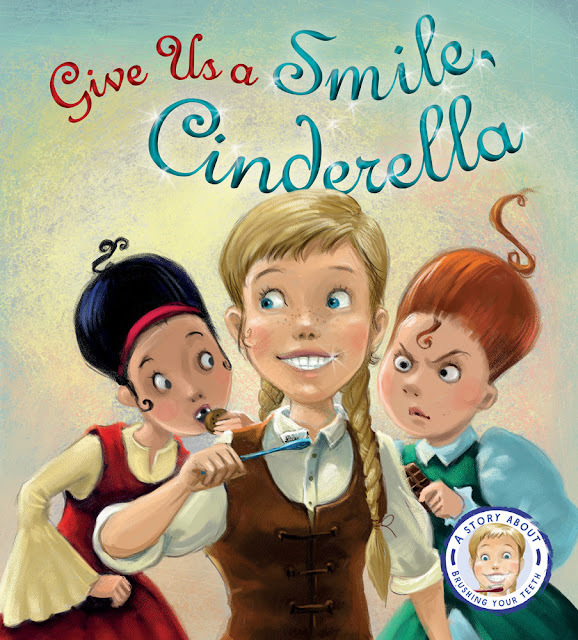 Give Us a Smile, Cinderella by Steve Smallman and illustrated by Marcin Piwowarski tells the tale of Cinderella with a twist. In this version the stepsisters are still mean to Cinderella and they are still very spoiled. They eat sweets all the time but they are too lazy to brush their teeth. Well their teeth rot and begin to fall out. Cinderella on the other hand always brushes her teeth no matter how tired she is from all the chores and work she does. When it is time for the ball, the stepsisters go off as usual and the fairy godmother comes and gets Cinderella to the ball. The prince is so put off by the stepsisters teeth and bad breath that he wants to avoid them. Then Cinderella comes dressed beautifully and with a sparkly white smile. The smile draws the prince right to her. She loses her slipper as she runs at midnight and slipper fits all three girls, but the prince knows Cinderella by her smile. The book does an excellent job of teaching the importance of brushing one's teeth and uses a fun twist on a classic tale to do it. At the end of the story there is a section for teachers or parents to lead a discussion about the book and relating it to the kids' lives. Hazel and I really enjoyed the story and the twist. Hazel actually read both books before I did. Rapunzel, Rapunzel Wash Your Hair! by Steve Smallman and illustrated by Neil Price tells the Rapunzel tale with a twist. 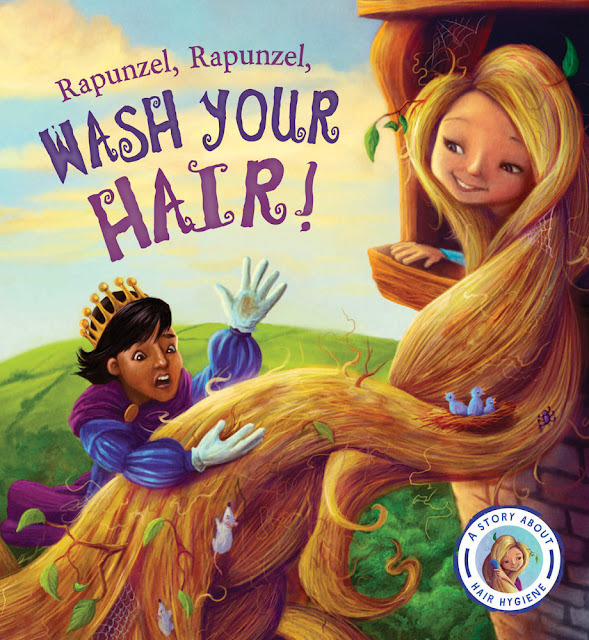 One day Rapunzel decides it is too much work to wash and brush her long hair. She lets it get so dirty that mice and birds live in it. Eventually the hair is so dirty the witch tells her she will not visit her anymore. A prince happened to see the witch go one time and waited for the witch to go away since he heard Rapunzel singing a beautiful song. When he tries to climb her hair he runs into trouble and gives up. Another prince heard about Rapunzel and brought gloves since he had heard the story of the first prince, but he also runs into trouble--head lice and gives up. A third prince comes to save Rapunzel. He brings a ladder, a hose, head-lice lotion, shampoo, conditioner and a selection of brushes and combs. He rescues Rapunzel's hair before rescuing her. However he did not want to marry her but offers her a haircut. He uses Rapunzel's clean hair to make wigs for everyone in the kingdom. Rapunzel takes such good care of her short hair the prince offers her a job in his hair salon. 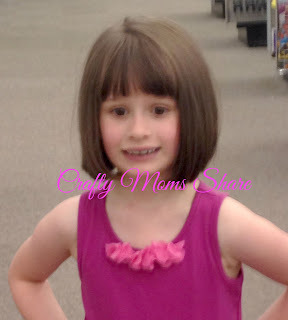 This one I really enjoyed because it was such a struggle with Hazel to wash her hair and to brush it when it was long. Now that her hair is shorter she is able to take care of it mostly. I wash it in the shower for her but she combs and brushes it and puts in her headbands or clips with some help occasionally. I guess we have the same solution as the prince did. And Hazel's hair will be used to make a wig for someone with cancer since she donated it. Needless to say I found this book to be perfect and wished we had read it sooner. Both of these books are fun and beautifully illustrated. 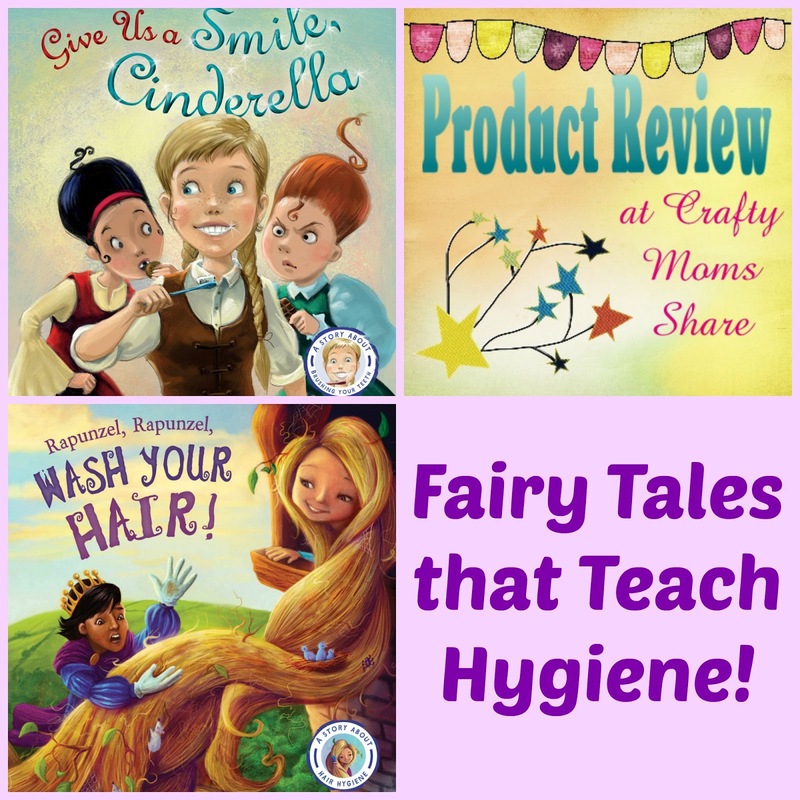 They have a twist on both stories that teach a lesson as well as bring good healthy habits to kids. 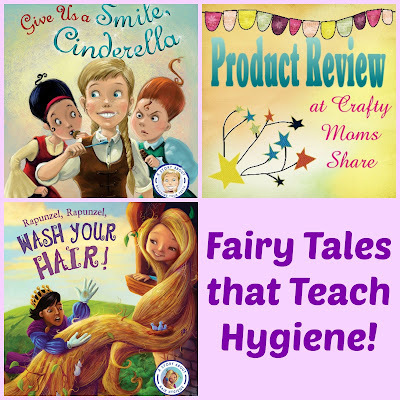 They are perfect for any child but especially for the ones who fight over a hygiene step! For more Cinderella and Rapunzel versions check out my Fairy Tales in Different Cultures Series and my Cinderella and Rapunzel Pinterest Boards.